Medicine Man is a collaborative portrait by Ohiri + Kassinen and is part of the Welcome Collection and Les Recontres d' Arles Collection. In 2012 the artist Ohiri's mother was unexpectedly diagnosed with cancer. Coming from a religious background the family remained optimistic in hope of a miracle that would defy science and come to stand as a true testimony to the power of God. However, no amount of anointing oil or prayers could save her life and she passed away suddenly leaving behind many of her possessions including the box of medication that was used to treat her cancer. Caught between fantasy and reality Ohiri would dream of having supernatural powers like that of the ancient medicine men, existing in an alternate reality where such powers could be used to cure his mother's illness. Ohiri shared his trauma of losing a loved one with his partner; side by side, Ohiri & Kassinen used the medium of photography and performance to create a fictional character called the Medicine Man, a being whose presence bears witness to a poignant chapter in their lives. 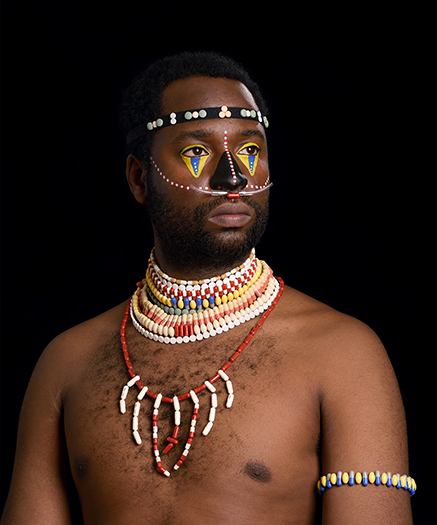 As Ohiri transforms into character, it is the hand of his partner that carefully applies his tribalistic face-paint, adorns him with sacred charms made from the remaining medication then takes this intimate portrait. This final stage of becoming and documenting the 'Medicine Man' acts as a joint mourning-ritual and closure for both artists, exploring the boundaries between time, space and existence.